Independent businesses and specialized retailers want the features and benefits of an advanced point-of-sale (POS) terminal without the cost and complexity associated with many high-end systems. A growing business requires added value at the point of sale, but without sustaining unnecessary expense. the upgraded features merchants want into a reliable and cost-effective payment device. While maintaining affordability and simplicity, it delivers a level of functionality usually only found in higher-priced terminals. This affordable POS solution is designed to meet the needs of today and be ready for tomorrow’s payment options. 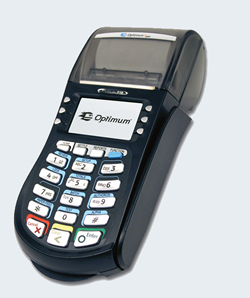 In addition to optional Dynamic Currency Conversion (DCC) service from First Data, the Optimum T4220 terminal is configured to accept virtually every payment option, including all major credit (American Express®, Visa®, Discover®, MasterCard®/Diners Club®, and JCB®), signature and PIN debit and gift cards. The Optimum T4220 terminal combines IP connectivity and dial backup with performance and security for faster, safer transactions and downloads in a budget-conscious payment solution. Its advanced features include 24MB of total memory and an ARM9 processor. An integrated Payment Card Industry (PCI) PIN Entry Device (PED) approved PIN pad allows the acceptance of debit cards.